The now famous Mossel Bay Classic is played in July every year..
Nine matches of 15 ends each are played over three days and from the second match on, it is competed on a strength against strength basis. Play takes place at the Mossel Bay Bowling Club and starts at 09:00 each day. Visitors are always very welcome to come and watch excellent bowls and also to enjoy the Club’s hospitality. 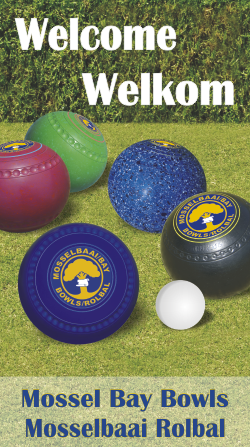 This annual tournament has been hosted at the Mossel Bay Bowling Club since 1991 and is always very popular. Entries are limited to 24 teams, the club’s maximum capacity, so there is always fierce competition to get a slot with teams from as far afield as Pretoria taking part. Many teams contain players who have been attending since the very first tournament and when a player can’t make it due to age or ill health, there is never a shortage of volunteers to fill that position. This is an invitation-only tournament, which means that if an invited team is unable to attend, the convener can select a replacement from the many hopefuls on the waiting list. Because of the status of this event, teams very seldom cancel and will brave illness, hardship, family calamities and have even been known to duck their own 50th wedding anniversaries, to attend. It is rumoured that most of our visiting bowlers actually attend because of the great weather and the fantastic food served by our catering team rather than the actual bowls games, but we must stress that it is an unconfirmed rumour and all teams have affirmed that it is the strong competition and great camaraderie which keeps them coming back every year. Though when we remind them about the seafood dinner and the braais, it always looks as if some of them might change their minds. Especially the seafood dinner… Our ladies pull out all the stops when catering for the Classic and it is well-known that no other club can compete with them in the kitchen, so hats off to our catering team who provide excellent meals and snacks every year. The Mossel Bay Bowling Club wishes to thank all sponsors and club members for their generous contributions, thus ensuring that the Mossel Bay Classic is one of the highlights on the Eden District sporting calendar.